When John and Trudy Jacobson started TransAm in September 1987, they envisioned a place where each person had the opportunity to be successful, respected, and appreciated. This is the same philosophy we believe in today. John and Trudy started TransAm with 50 trucks in Kansas City, MO in the Hunt Midwest underground caves. Yes, that’s correct – TransAm started in underground caves! Paul Kennedy was hired as the first company driver in November 1987 and he still drives for TransAm with over three million accident-free miles. Wow! The first load offered to TransAm was from Pillsbury, but there was a problem to overcome – TransAm’s trailers hadn’t yet arrived from Utility Trailers. John and Trudy, being the innovative couple that they are, devised a plan to borrow a trailer from their friend who owned another trucking company. There was no way that John and Trudy were going to turn down the first load offered to TransAm just because they didn’t have a trailer! The Jacobsons’ attitude of working to overcome any obstacle has driven TransAm from the beginning and still drives TransAm today. On July 4, 1990, TransAm relocated from Kansas City, MO to Olathe, KS using an old Allied moving van that the Jacobsons purchased to move TransAm’s office. The Allied van still exists today and sits to the south of TransAm’s driver entrance gate. In 1990, the Jacobsons also hired Russ McElliott who is the current President of TransAm. By the end of the year, TransAm had grown to include 87 trucks. Over the next several years, TransAm continued to grow and add trucks to its fleet. At the rate that TransAm was growing, the Jacobsons could see that TransAm was going to need to relocate again to a larger facility. They then purchased 45 acres of land down the street from their current location. In May 1999, TransAm moved into its new corporate headquarters where it is still located today. By this time, TransAm had grown to about 500 trucks in its fleet. Looking to expand its business and geographical reach, TransAm purchased James Helwig & Sons on March 1, 2005. This company was located in Rockwall, TX and allowed TransAm to expand its fleet to 800 trucks. TransAm was having great success in the trucking business and wanted to diversify its business interests, so in August 2007, a new financial services company called TAFS was started to purchase accounts receivables. In 2012, TransAm opened its own body shop on land just north of its corporate office. By 2014, TAFS has grown to one of the largest freight factors in the United States. On April 15, 2015, TAFS moved into its own new corporate offices – a 35,000 square foot building located east of TransAm’s body shop. 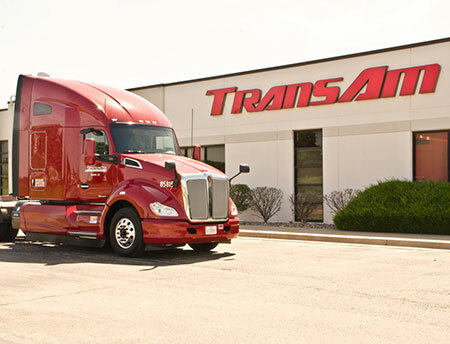 By TransAm’s 30th birthday, the company had grown to over 1,000 trucks with over 1,600 employees and contractors. Wow! So many things have changed over the past 30 years when John and Trudy Jacobson started TransAm. However, many things also remain the same. TransAm lives by its noble purpose, which states, “Trucking is a Noble Profession and Truck Drivers are Noble People.” TransAm’s core value is “Deliver the best driver/customer experience. Be a great listener. Be empowered. Be innovative. Be consistent.” These principles will lead TransAm to another great 30 years. From John & Trudy Jacobson and Russ McElliott, we would like to thank each and every one of our dedicated employees and contractors who have made TransAm such an amazing company. We would be remiss if we did not recognize the people who have passed on or retired who also helped build TransAm into the company it is today. Thank you all.